The wife and I decided to take on a “smaller” project yesterday. So we went in search of an “Apartment Status” development on the eastern side of Singapore - the land of “baby penthouses” and tiny apartment units. And we found just the right candidate in MELROSE VILLE. 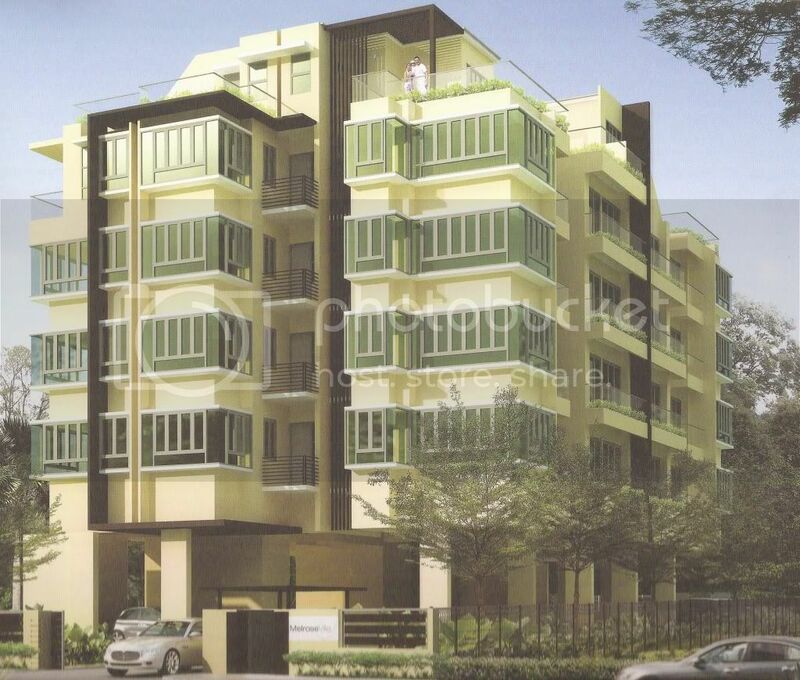 MELROSE VILLE is a 28-unit, 5-Storey project situated on Rose Lane, just off Tanjong Katong Road. It is located on a small 14,000sqft plot, and is expected to TOP by 31st December 2011. The project is developed by TKE Development Pte Ltd, which pardon our ignorance, is a developer that neither the wife nor I have heard of till yesterday. Subsequent web search proved futile in revealing any useful info about this developer. But we understand that TKE has also developed “Çasero @Duman”, which was completed in 2008. This is another small project (15 units) located on Dunman Road, which was supposedly sold out within the first day of launch! Being a small project, MELROSE VILLE has the most basic of facilities – all you get is a 16.5m x 5.2m swimming pool, Jacuzzi and BBQ pits. There are a grand total of 28 carpark lots on the ground level, and the whole building will be serviced by just one lift. So for residents intending to purchase bulky furniture, do make sure that (a) it can fit into the lift, and (b) the lift is functioning that day. There is also no security guard service, with access in/out of the development via an auto-gate. There is not exactly a showflat at the sales gallery – we rather call it a “representation” of the type of furnishing and fittings that you can expect to get with your unit. But instead of asking you to visualize what your unit will look like by staring at the tiles/marbles/fittings hanging from a wall (ala “The Interlace”), all the furnishing and fittings are put in their proper places in a “mock up” of the various living spaces within the unit. • Homogenous floor and wall tiles in all bathrooms – only shower cubicles are provided even for the master bathroom. So no lazing in the tub after a long day at work. • “Ariston” hob/hood – you have to procure your own oven, fridge and washer/dryer. • We were actually quite impressed with the furnishing provided by MELROSE VILLE. The materials used for the wall, flooring and wardrobes looked to be good quality and very pleasing to the eyes. • MELROSE VILLE is located within walking distance from amenities, e.g. City Plaza, Tg Katong Complex, Old Airport Road Food Centre etc. It is also supposedly a 10-min walk to the upcoming Dakota MRT station. • The wife and I are not particularly excited about the location of MELROSE VILLE. Yes, it is supposedly located in prime District 15, but as the saying goes… there is D15, and there is D15. Rose Lane is also a rather narrow road with a row of inter-terrace houses on the opposite side. So good luck to second car owners or guests trying to find road-side parking. • If you have been following our posts, you will realize by now that neither the wife nor I are fans of “Mickey Mouse” apartments. We still cannot come to terms with how a 1270sqft apartment can be called a “penthouse”, and regard this as utter degradation. Even with the so-called 2000+sqft penthouse units in MELROSE VILLE, be prepared for 400 - 500sqft of roof terraces, judging from the floor plans that we have seen. • From the floor plan, all units have their utility room located either in the living room or within the kitchen – not very ideal if you intend to use this as the maid’s room. • Again from the floor plan, all units have very small yard area. So expect quite the challenge when it comes to doing your laundry. • Unless you are Korean, we are unable to locate any primary school within 1-km of MELROSE VILLE. MELROSE VILLE was launched only 2 weeks ago, and 50% the units have already been sold. Most of the units were supposedly bought for rental purposes – we were told by the marketing agent that units at MELROSE VILLE can easily fetch rentals of $2800 - $3000/month, but somehow we are not too convinced. For those interested in the penthouses, you be happy to know that as of yesterday, all 4 units are still available. In terms of pricing, units in MELROSE VILLE are asking around $1100 - $1300psf, with the penthouse prices average around $1000psf. The 1421sqft, 3-Bedroom + Family area penthouse is selling at $1.45 million, which translates to about $1020psf. In our humble opinions, MELROSE VILLE is somewhat over-priced. We can almost hear the voices of protest - given the freehold status, supposed D15 location and especially when nearby leasehold property like 'Silversea" is selling at above $1500psf. But we are not exactly comparing "apple for apple" here, are we? In summary, MELROSE VILLE is definitely not an option for yours truly. No Comment to " MELROSE VILLE (Preview) "